Finally! A workout collaboration app that brings it all together. Athlink provides software designed with the athlete in mind and built to improve the way coaches, athletic trainers, personal trainers, physical therapists, doctors, and parents interact to help them achieve their goals while providing comprehensive risk management to all parties. When a player is injured, Athlinks risk management tools help athletic department staff manage recovery and return the play procedures that are documented and available for easy retrieval if needed. Using a single iOS or Android app and a centralized web portal, the athlete can receive workout and rehabilitation assignments from coaching or rehabilitation resources, anytime, anywhere. Athlink stores workout assignments, histories, and skill measurements that travels with players as they transition from team-to-team or coach-to-coach and allows their “Athlink Profile” to be built in real time, quickly and easily. Get fitness information about new and returning players and create a program using workouts from our public library or use your experience to create a program from scratch. Participate in your child’s athletic development and help them stay injury free both on and off the field or court. Use our tools to track individual client progress and billing with confidence so you can focus on training people anytime, anywhere. Get into better shape, lose weight, or just maintain a comfortable fitness level using our library of workouts or create your own fitness plan. Only 30% of patients fully complete their plan of care because they simply can’t remember how to do the rehabilitation exercises they are given after they leave the clinic. Athlink has the tools to help patents respond to treatment better and recover more quickly because they are given clear, concise steps for each assigned exercise complete with how-to examples and detail, all in the palm of their hand. Use our extensive database to assign recovery exercises and get a history of how many times the patient completed those assignments between visits. For athletic trainers, use our communication features and return to play risk management functions to insure a legally defensible process beyond the mandated protocols. 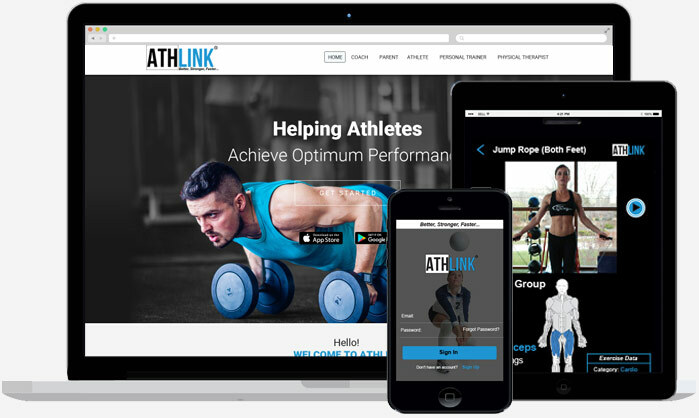 Using our web portal/mobile app design, Athlink creates a truly mobile experience for the athlete. Not only can athletes take their conditioning assignments with them anywhere in the world, they can also transition from self-managed to coach managed to physical therapist managed quickly and easily. Workouts are pushed to the athlete on the same app no matter who creates the assignment.